We sell a limited range of Drennan, Nash & ESP terminal tackle from the fishery office. So if you are short of hooks, weights, floats, line or carp bits and pieces we can usually sort you out. We also sell pellets, boilies, groundbait and sweetcorn, plus a range of trout pastes and pellets. We don't sell any live bait - these are available at tackle shops in Castle Douglas and Dumfries. We have a selection of wet and dry flies to purchase. 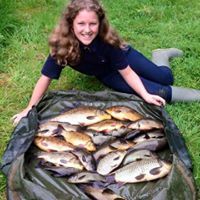 We have tackle hire available for our fly pond, trout bait pond and coarse pond. If you've never fished before you'll need to arrange a bit tuition. 30 minutes on our trout bait lake would get you going, showing you the basics of casting, hook tying and the art of float watching! If you want to learn the more challenging art of fly casting we can arrange 3rd party tutors to provide half day lessons.